In addition to textbooks, software, and teaching styles, another tool which has the potential to affect learning outcomes is classroom furniture. Harkness tables, whose shape and seating require eye contact and eliminate status positions in a classroom, are one example of how furniture can influence what happens in the classroom. Another example is the Node desk. For the first time, Episcopal School of Jacksonville (ESJ) World Languages teachers are using specialized Node desks in their classrooms to better facilitate the development of language skills. Josephine Sanchez, the school's World Languages Department Chair and also a Spanish instructor, approached the school's administration with a request for the desks. 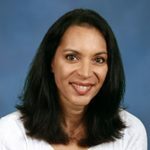 "It is my vision to continue to move our World Languages Department forward so that it aligns with the school's initiative for a more learner-centered approach to teaching and to better develop 21-century skills in our language students. With the versatility of these desks, students can now easily shift into paired and group activities. The class can easily be divided into two groups for debates and even a Harkness configuration to develop collaborative skills, critical-thinking skills, and communication skills all in the target languages. With these desks, I am very excited about our students' learning experience in our World Languages classrooms," said Josephine. Through a generous gift from a donor, the Polster family, the school was able to put them in two classrooms this year. Node desks are mobile (with wheels) and can easily be put into pairs, groups, and even a large circle for Harkness-type discussions. Here's why it's important to have them in World Languages classrooms. ESJ instructors Carolina Collins and Rebecca Howes, who have the desks in their classrooms this year, have found that the equipment is already a catalyst for positive learning experiences. Spanish instructor Rebecca Howes has found that the Node desks have permitted her to include more group work in the classroom. “For my Spanish Honors 3 class, we were able to mobilize the Node desks into a semi-circle to conduct a Harkness class. For both my Spanish 2 and Spanish 4 classes, I have included within the curriculum Quizlet Live. Quizlet Live requires students to move into groups to practice both vocabulary or a sequence of events in regard to a particular reader,” said Rebecca. The desks help collaboration among language students with different student-centered activities created by the teachers, such as communicative activities, TPRS activities (Teaching Proficiency through Reading and Storytelling), and have helped to develop students’ communication and creative and critical thinking skills. Madeline Pruden ‘20, who is in Honors Spanish 4 with instructor Philippa Marks, says the desks have helped with collaboration and interaction with her peers. “There is more communication, and visually being face to face with people who are talking, speaking with a partner, helps everyone listen,” she shared. Emily Waters ‘19, also in Honors Spanish 4, agrees. “Especially for languages, they are very helpful when working in groups, and then we can separate for projects,” said Emily. Another feature of the Node desk is the space provided for students to place their backpack and books underneath. This provides more access for students to move around in the classrooms and gives the instructor the space to circulate to make sure that students stay on task. “Ultimately, I truly believe that the Node desk is the right solution. It creates teaching spaces that work with both students and teachers. It favors student-centered learning over teacher-centered learning,” shared Rebecca. Being clear about this goal makes it easy to explore how different types of furniture have the potential to elevate teaching and learning and to use furniture in ways that inspire teachers and students alike.